Westside Montessori School (WMS) offers a year-round program with enrollment for students 18 months through eighth grade. The school year begins mid-August and ends in May. A summer program is available during the months of June and July. Enrollment at WMS reflects the dynamics of West Houston, so as students advance, and families move to new jobs or foreign assignments, positions in the various programs and classrooms become available. Please don’t hesitate to put your child’s name on our waiting list. Returning Students – Preference is given to currently enrolled students. Current registration forms will be found on our WMS Forms page. Registration Fee – There is a $200 registration fee for the 2017/2018 academic year paid at the time of a child’s initial enrollment. A Re-registration fee of $150 is due in February of each year in order to hold an already enrolled student’s place in the classroom for the next academic year. Tuition Deposit – A deposit equal to one month’s tuition is assessed at the time of enrollment. This deposit is held on file in the child’s name until WMS receives a 30-day written Notice of Intent to Withdraw. This withdrawal notice must be received while the child is still enrolled in order for the tuition deposit to pay for the final month’s tuition. Supply Fee – Annual assessment of $300 for the first child; or $400 for a family of 2 or more children. This fee is due on or before August 1st of each school year and will be prorated for students enrolled after January 1st. New Students – Please contact us by phone or email with any questions about the school, our programs, enrollment procedures or specific questions concerning your child or circumstances. We welcome your questions because we know that choosing the right school for your child is very important to you. 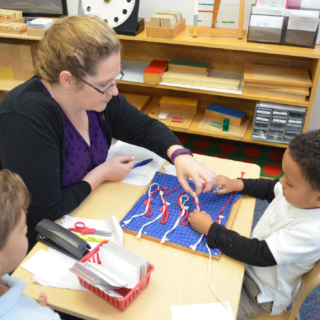 Visit Us – Westside Montessori School’s faculty encourages interested parents to visit the school. We provide personal tours Monday through Friday between 9:00-11:30 a.m. 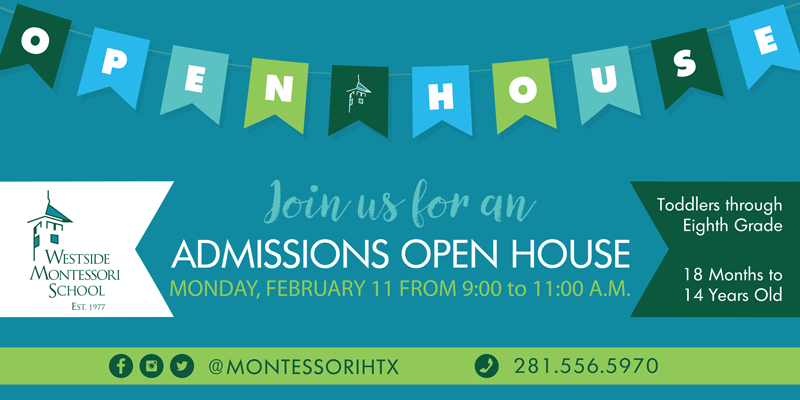 Please call the school at 281.556.5970 to arrange a tour appointment. We ask that visitors be flexible in their request for a tour, as our first priority is always the care and comfort of our students. WMS also holds several “Open House” events during the year. Please contact the school office to request notification and an invitation to our next event. Many of our Westside families move to the area from other parts of the United States or other countries. Distance and the need to make remote decisions about schools can be stressful. Our staff is happy to provide parents with as much information as possible to help make a decision that is right for your family. We are proud of our cultural diversity and encourage children to share their different experiences with their classmates.